In Part 1 we looked at the film compartment of the Bessa III. I forgot to mention that there’s a 120 or 220 film selector on the backdoor which will show how long a roll of medium format film you’re using. There’s also a slot on the back for putting in the film stub to remind you what film type you’ve loaded into the camera. Don’t forget to do this if you change film types often. 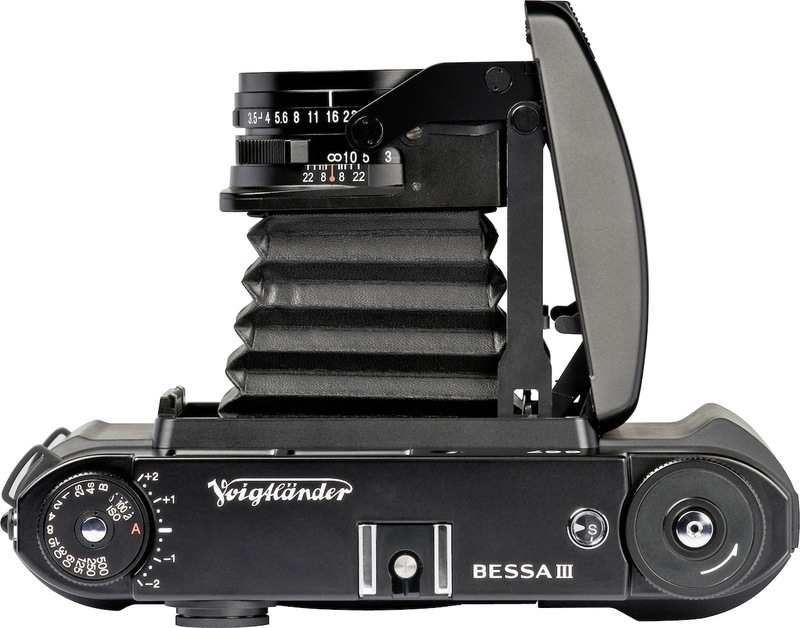 In Part 2 we will now look at the top plate of the Bessa III. Personally I find this area of the camera to be the most well designed. I like it mainly for its simplicity and spacious layout. The shutter dial on the left is nicely integrated with the exposure compensation and the film ISO setting. By default the dial is locked to the red “A” which stands for aperture priority. To set the shutter speed you push the silver button while turning the dial to the desired value. To set the exposure compensation you do the same thing except this time you line up the red “A” marker (instead of the white marker) with the -2 to +2 scale. As for the ISO, you lift up the dial to move the internal wheel and release the dial when you are on the desired ISO. Very elegant and speedy operation. In the middle of the top panel is the flash hot shoe. There’s also a standard PC flash outlet on the left which is covered by a rubber plug. I’ve used this once in a studio setting to trigger radio remote flashes and it worked quite nicely. A Bessa III with a flash/remote mounted is surprisingly easy to handle and well balanced. Over on the right is the mechanical film counter, film advance dial and shutter button. The film counter is well spaced and easy to read. It will either advance to 10 or 12 depending on whether the 6×7 or 6×6 frame is chosen. If you are using 220 film it will advance to higher numbers respectively. The biggest area of debate is the shutter button and film advance dial. Some folks find this part a little too plastic-y and toy like. I don’t mind it all that much and the fact that it’s plastic means it weighs less and is easier to turn. I’ve only had one minor slip up which resulted in two frames overlapping slightly. The shutter button releases a leaf shutter which will be the quietest and most inconspicuous thing you have ever heard. And finally, the viewfinder is just absolutely gorgeous to look through. It’s the largest and brightest of all rangefinders I’ve used. The frame lines are minimal and clear and they will shift as you turn the focus dial to correct for parallax. For the amount that the lens protrudes it’s surprising that it doesn’t really block the viewfinder at all. The lettering and font is also quite elegant and minimal with just the white “667” on the front. In summary the controls are simple and intuitive letting you focus on what’s most important – your subject matter. This entry was posted in Bessa III and tagged 120, 220, 6x6, 6x7, Bessa III, leaf shutter, medium format film by Adventures in Photography. Bookmark the permalink.